Ipswich sparrow just after banding. Band combination is Left: Blue/Red, Aluminum, Right: Pink-blue-red. Photo by Laura Duval. The Center for Conservation Biology is asking bird watchers to be on the lookout for and report banded Ipswich sparrows. The Ipswich sparrow is a specialized subspecies of the savannah sparrow that spends its entire life cycle within the narrow ribbon of dune habitat along the Atlantic Coast. The entire population breeds on Sable Island off the coast of Nova Scotia and winters along the coastal dunes primarily from the Carolinas through Massachusetts. Birds are being marked as part of a collaborative investigation of demography. Winter mortality is believed to be the principal limiting factor that regulates the population. Parks Canada, Dalhousie University, and Acadia University are investigating breeding ecology on the Sable Island breeding grounds, marking birds to estimate survival, and using nanotags to study migration ecology. The National Park Service and CCB are marking birds on the winter grounds to better understand patterns in winter survival and habitat use. Video of banded Ipswich sparrow on Chincoteague National Wildlife Refuge. Video by Bill Hohenstein. Several hundred birds have been banded with unique combinations of color bands so that individuals may be distinguished and tracked through time. A bi-color band has been paired with an aluminum band on one leg to indicate location of banding. To date, blue/red and yellow/orange have been used during winter from North Carolina through Delaware and a yellow/green band has been used in New Jersey. 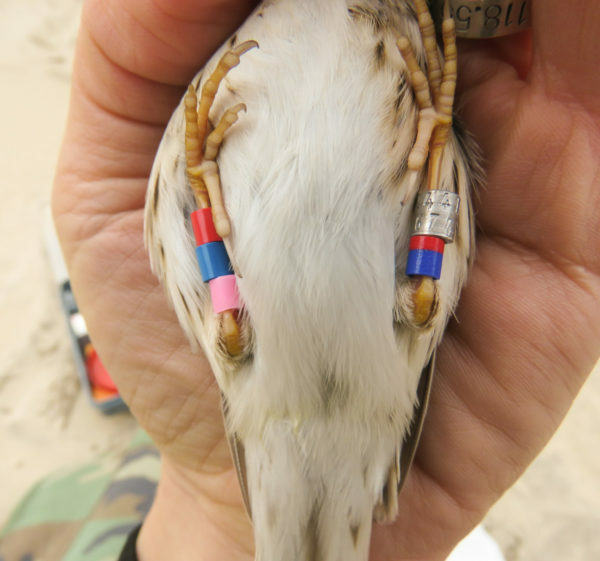 White/red and white/black bi-color bands have been used during the breeding season on Sable Island. 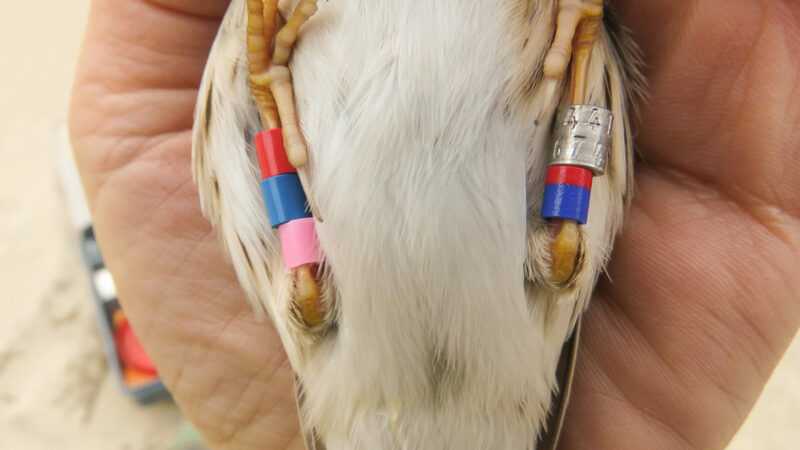 In all cases, the opposite leg has been banded with three color bands. 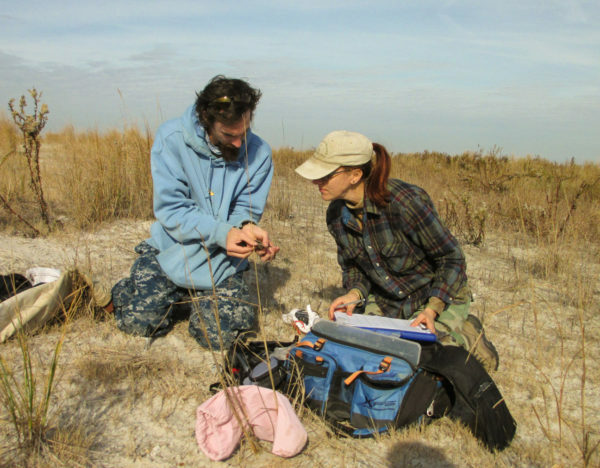 Chance Hines (lft) and Laura Duval (rt) process an Ipswich sparrow on Assateague Island National Seashore as part of the winter demography study. Photo by Bart Paxton. Date and location of observation. Band combination – which bands on which legs and in what order read from top to bottom. Example – Left leg: Blue/Red bi-color over Aluminum, Right leg from top to bottom Red-Yellow-White. Ipswich sparrows spend most of their time foraging or running along the ground making it difficult to read band combinations. Photographs are helpful in obtaining and confirming band resights. Please report resights and photos to chhines@wm.edu and ipswichsparrows@gmail.com.